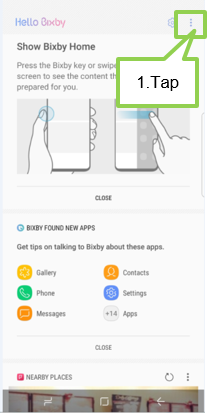 [Galaxy S8/S8+] [Note8] How can I turn off the Bixby Key? Step 1. Open the Bixby Home and tap More. You can select what happens when you push the Bixby key if you update Bixby to the latest version. For example, you can choose to open Bixby Home as it does currently. Or, you can select “No Action” if you do not want anything to happen when you “short press” the key. Step 3. Tap Bixby Key. Step 4. Tap on Don't open anything. Why Samsung keyboard appears not on center position and parts of it are cut?